This lovely beach house has it all: prime Good Harbor Beach location, views, historic charm and modern comfort and style. The original cottage was built as a stone carriage house to a neighboring estate. A wonderful octagonal addition has created a three bedroom/two full bath home that boasts a large modern eat-in kitchen, two spacious sitting rooms and a private yard, all just a pebble's toss from the white sands of Good Harbor Beach. The original part of the house consists of an eat-in kitchen, large living room with access to the deck with views of the yard and beach, two bedrooms, a laundry room and full bath. Up a few steps is the octagonal light-filled family room, above which is the fabulous master bedroom with a queen-sized bed, glorious views of the sand and surf, Juliet deck, and a full bath with a shower. Walk or drive in the opposite direction from the beach and you will come to the spectacular stretch of Bass Rocks famous for photo opportunities of the Atlantic crashing against the rocky coast. Come and enjoy Gloucester, as it should be. In addition to vacation rental, this home is available to rent long term or short term in the winter. We are glad to hear that you had a wonderful stay at Beach Stone Cottage! We hope to welcome you back again sometime soon. A wonderful stay at Beach Stone Cottage. This was a great rental. The location was right next to Good Harbor Beach, and it was very close to supermarkets, a drugstore and restaurants. The parking was ample for everyone in our family. It was a perfect house for our two year old grandson, and the master bedroom had the most awesome view of the beach. We were lucky to have great weather so we spent most of our time at the beach with a drive to Rockport and downtown Gloucester two mornings. We enjoyed eating on the deck, and the kitchen was well stocked with utensils, pots and pans, dishes and silverware. The only thing we would have liked better was a king size bed in the master bedroom. The rental agent provided excellent customer service when we called to ask questions. We will definitely return. The home is beautiful, comfortable, and very well maintained. My only complaint is the 10:00 a.m. checkout...setting the alarm on the last day of vacation so you can wash the laundry and clean the house was the only downfall of our vacation. Lovely holiday in a perfect spot! We rent Beach Stone Cottage so that we can spend a week at Good Harbor Beach. Easy walk to beach and wonderful walking and biking. The house is very clean and the kitchen is perfect for family meals. Nice deck and picnic table too. We very much enjoyed our stay. The house location is great, right next to the beach. it is a charming house. Everything was in very good condition and we loved the outdoor space, including a lovely deck and grassy area. We have only two negatives. There is no air conditioning and we had one day and night which was very hot. The fans didn't quite make a difference and our two grandchildren were fairly uncomfortable. The rest of the week was fine and the fans kept us cool. We also would have liked a bit more seating capacity (maybe another couch). We gathered from all over the world (4 of us) to enjoy the feeling of being nestled indoors while in the elements. It was the throws of Winter on a New England beach, we got plenty of writing done! Good Harbor Beach is a gem and we love being able to stay so close and walk to the ocean. The house is clean and well organized and has plenty of room for our family. The only drawback of the house is the growth of plantings around the house. 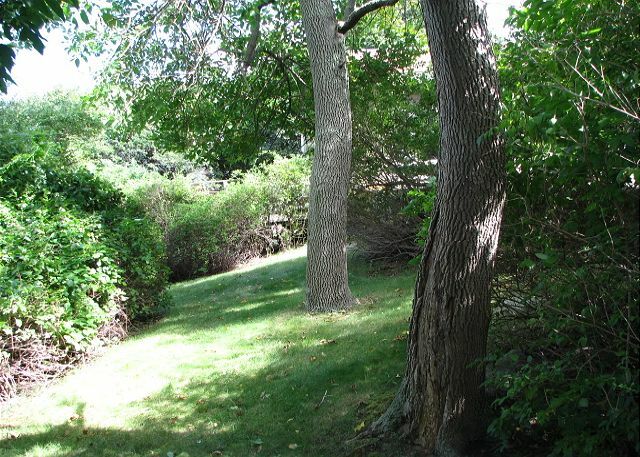 While it is nice to be shady and have privacy, trees and bushes are a bit overgrown, feeling dark and limiting views of the beautiful ocean just steps away. We would love more sun and more of a view from an oceanfront home. It was a perfict vacation week. The weather was the best of the summer. Superb house in wonderful location. Atlantic handled the last-minute change very professionally, creatively, and smoothly. We were very satisfied! The only addition the house needs is a hand rail by the steps between the octagon and the main house...and a few hooks in bedrooms (e.g., on doors and in closets). Thank you for taking the time to complete the satisfaction survey. Feedback from our guests is very helpful to the Atlantic Vacation Homes staff and homeowners.We are glad to know that your stay with us was a good one for you. We hope to see you again in future years. Thank you for taking the time to complete the satisfaction survey. The staff and homeowners here at Atlantic Vacation Homes appreciate the feedback given to us by our guests. We are pleased to see that your stay was an enjoyable one and hope that we see you again in future years. Thank you for reviewing Beach Stone Cottage and we are pleased that you enjoyed your stay with AVH.